A bit of performance art on the Bald Spot last night. Details on Northfield.org: Carleton to Stage Rare Performance of Controversial “Piano Burning.” Click the thumbnails to scroll through the photos and watch this 25 second video clip. Should have known you would be there, Griff. I was there, too, and then caught the couple seconds of tape on Kare ll at the end of their 10 p.m. broadcast, which was led into with the words, “Piano Burning: Art or Destruction, You Decide.” The highlight of the evening was when a few Carleton students started singing, “Piano’s burning, Lord, Kum Ba Ya…” or however it is spelled. Did you happen to see any members of the fire department on hand, as sparks flew into the crowd? 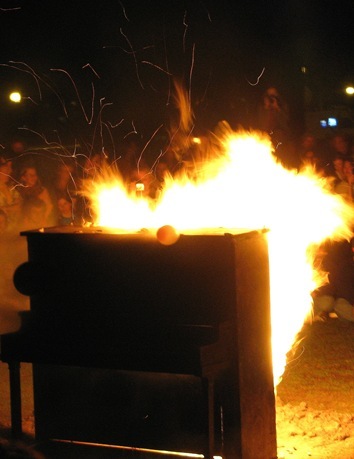 I always find burning pianos painful to watch. Although I do see the ‘entertainment’ aspect, I always think of the amount of work that goes into constructing one. Doug Bratland on Northfield.org: Piano for Pyros: video and photos of Carleton’s “Piano Burning”, with links to MPR, Kare 11, and the Pioneer Press. So, this is art, huh? I suppose a person can label anything any term they want, but I have a hard time connecting with this. Seems like I heard someone say something like not all entertainment is art, and not all art is entertainment. I think that is an appropriate application in this instance. and has been done before, just look on youtube. MHMMMM just wondering if part of our added sales tax for “the arts” paid for this????? Carleton paid for it. The piano was a “dead” piano, so I would assume the cost was minimal. I was there, it was pretty cool. I’m arty. I was there. It was interesting in ways that I hadn’t expected, but for most part, it seems that people just like burning stuff and watching stuff burn. Did I find it to be “art”? Hmmm… an almost impossible question. 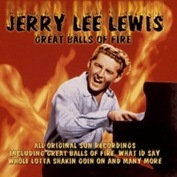 I think the point of most “performance art” – of which the original piano burning in 1968(?) was a seminal event – is to force the question upon the spectator: Is this art? I overheard that question, or a version of it, many times from other onlookers at this event. It may not be art, but it would be a sight worth seeing. I wish I’d been there. I’m not hearing impaired, but I don’t hear a “variety of pitched and unpitched sounds as the piano strings heat and break,” in that video, either.